One thing I wanted to do at SXSW was go to the Gaming Expo and visit Ryan Green, whose family was featured on one the Soul Pancake documentaries (as was I.) Ryan is creating a video game based on his experiences with his toddler son, Joel, who tragically died of his cancer. He had crowdfunded the game -That Dragon Cancer. I financially supported him, as did many. His game will be out this year. More importantly I feel an emotional connection to him and his family. I followed his posts avidly and felt I'd come to know this family as they dealt with this most terrible of tragedies. I admired the way they are surviving and am awed at the grace of the human spirit. They have included their son in the game: his laughter, his voice, and have recreated scenes they experienced with him. It's quite beautiful. When I heard Ryan was going to be at SXSW, seeing him became a priority. I walked into the gaming expo, which instantly reminded me of my early casino days, working as the skinniest Keno runner in history. Outside was a bright, sunny day, light breezes blowing, the Texas flag flying. Step inside and you are in darkness, with glowing neon signs and the sounds of electrons talking to each other. There were rows upon rows of games - many of them ones you (or your kids) know, and many new games you've never heard of. I had no idea how I was going to find Ryan so I did it the old fashioned way: down one aisle, then up the next. Did I mention that I was the oldest person at SXSW? I think I did. Eventually, there it was, That Dragon Cancer. Ryan and another developer were talking to somebody else, but Ryan recognized his cyber stalker and said, "Hi Ann." We chit chatted and he asked if I wanted to play his game. Naturally, I wanted to see what he'd been working on in person, so despite my unfamiliarity with gaming I grabbed a controller and sat down. As an aside - my kids, of course, grew up playing video games. In a way, I did too - Pong came out when I was 16, and I spent many years in arcades and bars playing Galaga and Centipede, which I became quite good at, often seeing my initials, AMS, listed as a high score. But the home systems passed me by - as a busy mother I didn't have time to sit down and play, although raising two boys, we did get many new systems, from Sega Genesis to the Nintendo Wii and everything in between. There was one exception to my playing video games: I did get into Animal Crossing for a while, and I had to learn the controller. When my interest in that game waned, so did my memory of how to use it. So when I saw down to play Ryan's game, I was apprehensive. I couldn't remember what button to push and couldn't smoothly navigate the joystick and couldn't do those things in a crowd of people who were all there as experts. Did I mention yet that I was the oldest in the room? Still, with help from Ryan, I managed to get around. Immersive was not the word for what I experienced. As I began the game, the clanging noise, the lights, the crowds faded away and I was transported to a playground, where I played with Joel. I fed ducks for him, manipulated playground equipment for him, listened to his laughter and looked around at the trees and scenery. I ended up in a hospital where, by using a See and Say, I heard the bad news about Joel's prognosis from all angles - his parents, the doctors. They spoke in their own voices, making a poignant scene all too realistic. The virtual room started raining soon, dreadfully, filled with water, thunderclaps bringing on feelings of alarm. The human voices faded out, the rain filled the screen, water rising, and I wanted nothing else but to be out of that room and away from the horror, feeling a visceral dread. And, mercifully, that is where the demo ended. I put down my headphones shaken, tears in my eyes. I sat for a minute, trying to recover and process what I'd experienced, taking deep breaths. I gathered myself, got up and just hugged Ryan. There was really nothing to say. He is winning awards for his game and I recommend you check it out and follow him on twitter and elsewhere. If you can donate to him, please do. There isn't much else like it out there. Not only is the game a touching and immersive experience, they are using this game to creatively honor their son's memory. The love and care in it shows. 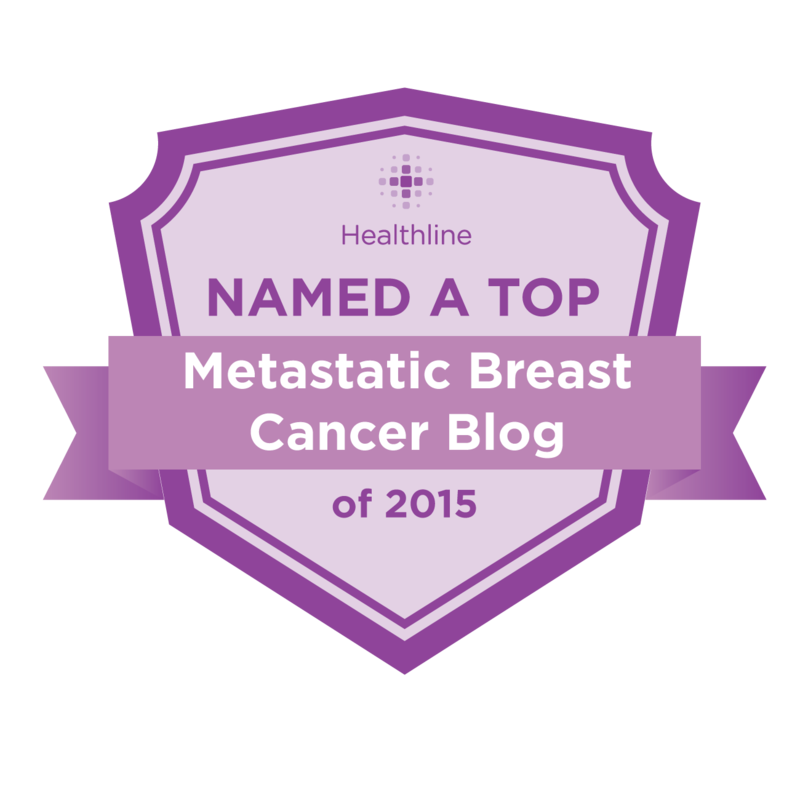 I've been a member of an online group of metastatic cancer patients for a few years. These women all live in Austin and get together regularly to talk treatment and cancer stuff, as support groups do. They also have an online component. The reason I joined another state's group is because I had a wonderful friend named Sandy Kugelman who was a member. Sandy was my cancer buddy, completely sympatico with me. We laughed, we cried, we talked about the political and personal side of cancer. We chatted nearly every day, sharing everything about our experiences. I still have many hundreds of messages from her. She, also, had liver mets. She, also had a son my age, and another older child. She mentioned her group and suggested I join but as a Californian, I felt I didn't want to intrude. Two years ago, Sandy died. I was as bereft as a person can be never having met the person in question. So I joined the group. If she liked them, why not? And these ladies are wonderful. They are everything you would want in a support group: educated, sharing, caring, intelligent and kind. They are up on the latest in oncology: new therapies, clinical trials and treatments. They understand their disease. So when I went to Texas, I had hoped to meet some of them. A meet and greet was arranged for me at a historical building, an amazing place filled with books and history. I met women from the metastatic league and their supporters. I got the warmest welcome, full of food, laughter and conversation. There is nothing like this where I am, or at least that I know about. The women all have mets, and they support each other, help each other and relate to everybody's experience in a non-judgmental way. Best of all, for me, they were all science-minded. There were supporters too. Husbands and fiances, all of whom were there to encourage their partners. We laughed, we shared our experiences, we discussed what's new in cancer treatment and the problems we experience in being metastatic. It was truly an amazing experience. I honestly felt like I wanted to move there after meeting this group. There were many speakers, from Jimmy Fallon to Malcolm Gladwell. But the one I set time aside for to see was Princess Reema of Saudi Arabia, whose biography is here. She splits her time between SA and LA, and is very interested in breast cancer awareness programs in her country. Unlike the US, which I believe has no more need for awareness, in SA women are relatively disconnected from their bodies. They must keep them covered, they are not educated about them and don't have the freedom we do to discuss this publicly. A recent study I read stated that even the women who attend college there don't understand much about breast cancer. So I am very supportive of her goal. When I went to see her talk, I was very impressed. There were several messages to take away from the things she said. One, very important one, was not to compare. This was in relation to her living part time in a country that is repressive to women, and then part-time in Los Angeles. She says if you can accept each place for what it is and has to offer and you don't compare, you can live a good life. And I feel like that is something we can all use in our lives. We should not compare our current lives with our past, healthy lives. We shouldn't compare our lives with the lives of others. The message is to just live where you are and take (and give) what you can. She is planning on having the biggest breast cancer awareness gathering in the world. On October 25, over 10k people will gather in Riyadh, SA, to support the effort and hopefully get into the Guinness Book of World Records. Please go to 10kSA.com to add your support. I was fortunate enough to be able to talk to her privately, and she also came to my talk. I was able to convey the position that many of us here take - that awareness has been achieved in the US, and that the effort has stagnated. Awareness is the logical first step, but then there should be another step after that, which has been forgotten by the large charities in this country. We must move on from awareness and into putting money towards something that will lead to a cure. (Do you hear me Komen Foundation? No, I know you don't.) Princess Reema is incorporating solutions within her awareness campaigns, for example, there are plans to do automatic testing of tumors as they are diagnosed for further research. The potential to cure breast cancer starts in a lab, not a mammogram machine, and I believe she understood that point of view. As I told her, a win for women in any country is a win for women in all countries, and I will look forward to see her success. I don't believe she intends to repeat Komen's error and treat breast cancer as a marketing event and forget it is a disease. And then, there was my talk. I had been very nervous about it, mostly because it was a format I was unfamiliar with. It was called a Core Conversation, which meant everybody in the room was supposed to participate. I'd searched online for weeks trying to see one but YouTube failed me. My partner, David Kopp of Healthline, and I were to talk about the problems inherent in curing breast cancer today, with him being the moderator and me being the "expert" and with everybody else in the audience supposed to dialog with us. When the event started, I realized my purse had gotten tangled up with my necklace and badge, and as I stood in front of the audience, untangling it, removing jewelry and putting it back on and laughing, whatever fears I had melted away. I felt very comfortable. Heck, everybody had just watched me practically undress, how much worse could it be? The room seated 125 and I believe it was about half full, surprisingly. David and I had planned some questions and answers and discussion points, but we mostly felt that we would let the conversation flow where people in the audience wanted it to flow - our plans were just in case nobody said anything. Fortunately, everybody was engaged. People shared their insights and a wide variety of topics were explored. We talked about how big data could help, how pharmaceutical companies could help, what had gone wrong and what could still go right. People shared their own experiences and insight. Everybody was enthusiastic, lively, had a unique point of view and we had a very good discussion. We recorded it so hopefully it will be on video and I can share it with you at some point. This was my first time speaking in public and I found it very easy, mainly because I was just talking and being myself, about a subject I feel passionate about. If I'd had to memorize something with this chemo brain, I'm sure I'd still be on that stage, stuttering away. If I ever do it again though, I will not be wearing those pants. So a month later, there is my SXSW experience. It was unforgettable, and I'm glad I went. Although I didn't change the world, I had fun, shared my ideas and met some great people. And, who can complain about that? Not even me, the oldest person in attendance. What an interesting time you had. That little boy video game sounds astonishing. And well done you for getting up and talking in front of all those people! Ann, I'm so glad the conference was amazing. I'm so glad you were comfortable during the talk. That video game sounds amazing and heartbreaking at the same time. Your experience is certainly unforgettable. Glad you went!